"Copyright© 2014 What Banana Studios"
"Heals by draining the blood of his foes"
Good morning, do you accept orders for characters? quick question, for the shadow did you simply copy and paste the actual character and made it a shadow using like layer properties or something then squish it down a bit in each frame? 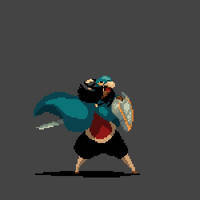 Hey, your artwork is really great, i am working on a game and need to get better with pixel art, could you help or explain me how you got so good? it's a shame that video games never actually use animations of this quality. i hope you're able to get this into a game. God knows they need improvements like these. Wow, he should be in Deep Dungeons of Doom! Great work Z. You really are very talented.